VMware’s vCloud Director offers a number of benefits over other cloud management tools on the market. One of these is ease of use, which makes VMware cloud hosting a good option for a small business that wants to use IaaS but hasn’t got much resource to throw at upskilling and getting to grips with a more complex platform like AWS. That said, there’s still a learning curve with VMware. Whilst this may not necessarily be an argument to invest in new staff to manage the move to cloud hosting, it is important that you understand the lingo and the parallels between real-world infrastructure concepts and cloud ones. With that in mind, here are a handful of common terms used by VMware and its community, as well as some from the wider world of cloud hosting. To start us off, here’s a simple one: a “virtual datacenter” is vCloud Director’s term for a complete IaaS environment comprising compute, storage and networks. In the VMware cloud hosting world, managing an IaaS environment is a lot like managing an actual data centre - so it’s easy to get your head around if you’re at all familiar with the real-world equivalent. OVF and OVA stand for Open Virtualisation Format and Open Virtualisation Archive. As their names suggest, neither is VMware specific - instead, OVF is a standardised file format that can be used to export and import virtual machines (VMs) across different cloud platforms. So, if you want to import a ready-made VM into your vCloud Director environment - or export one of your own VMs to use elsewhere - then you need those VMs in OVF or OVA format. Similar to the above, a vApp is VMware’s name for a logical grouping of one or more preconfigured VMs that package an application or service for rapid deployment. vApps can be edited in vCloud Director, saved as templates, stored in Catalogs (see below) and exported as OVF files, so it’s easy to move them between virtual datacenters and deployed as many times as you like. 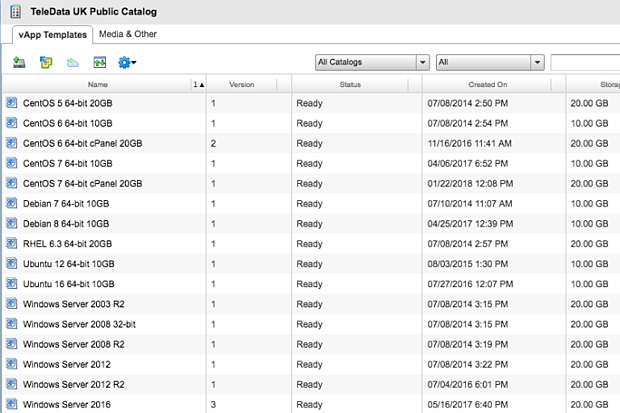 A VMware Catalog is a library of VM templates, vApp templates and ISOs that can be deployed in your virtual datacenter in just a few clicks. They can be private, so only members of your organisation can use them, or else shared with other organisations or offered up for public use. As a VMware user, creating VMs and vApps from Catalogs - and installing software from ISOs stored in Catalogs - is one of the key ways you’ll save time when it comes to setting up virtual servers and getting applications up and running. In contrast to templates, a VMware snapshot is a short-term method of capturing the state of a VM’s disks, memory and settings to provide a temporary restore point before you make a temporarily risky change. Snapshots aren’t meant to be used as long-term backups and VMware recommends they be kept for no longer than 72 hours (as keeping too many for too long can have a detrimental impact on VM performance). Hot-Add is a VMware feature that enables users to upgrade a VM’s CPU and memory without powering off that machine, making it possible to ramp up your cloud resources at times of high demand without disruption. This allows for more granular control over resource spend without having to schedule downtime, so you never need to overprovision to make life easier. Finally, NSX is VMware’s virtual networking platform and a key component in any VMware virtual datacenter. In order to connect your IaaS environment to external networks, you’ll need to do this through NSX Edge (called the Edge Gateway in vCloud Director) - a virtual router that provides what ought to be a familiar list of networking services, including DHCP, firewall and VPN functionality. We’ve written at length about VMware NSX in the past and it’s an important part of the vCloud Director ecosystem for users with complex security needs, so it’s worth exploring in detail if you want to fit out your IaaS environment with robust virtual implementations of traditional network security measures. Find out more about planning a seamless transition to the cloud in our IaaS migration checklist.